My name’s Helen and I live in the beautiful countryside of Somerset, England, in a little stone cottage on the edge of the village. I started Bustle & Sew back in 2009 and have been stitching for more years than I can remember. I come from a long line of skilled needlewomen and I made my first (rather wonky!) stitches under my mum’s gentle guidance nearly half a century ago! I love to create with fabric and thread – embroidery and applique are my favourite techniques, together with designing patterns for cute softies. My daughter Rosie joined Bustle & Sew in 2014 and is a very important part of the team, coming from a publishing background. She lives in the beautiful city of Wells with her husband, their little boy and naughty Goldendoodle, Tilly. Rosie loves to bake (when she has time!) and has a growing collection of Emma Bridgewater teapots. 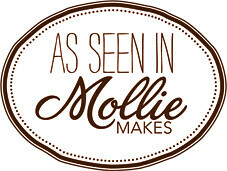 It all began with my blog, specifically for sewing – tutorials, giveaways, pattern promotion etc. 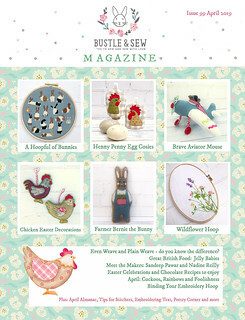 Bustle & Sew was only a blog until February 2010 when I sold my very first pattern on Etsy! I discovered, over time, that my real passion is for creating new designs that I hope will inspire others to pick up needle and thread and discover the pleasure and satisfaction of creating something for themselves. We run Bustle & Sew from my home – an old stone cottage on the edge of a small village in beautiful rural Somerset, very close to the lovely city of Bath. Every month we publish a digital magazine for our subscribers, with a selection of my own patterns, as well as articles and features that we send to readers as far away as the USA, Australia, Brazil and Japan (as well as the UK). All of our patterns and our Magazine are sold as easily downloadable pdf files aimed at the stitcher with beginner to intermediate skills so are attractive to a wide audience. As well as digital products we also sell a range of unique craft kits which we hope you’ll enjoy!